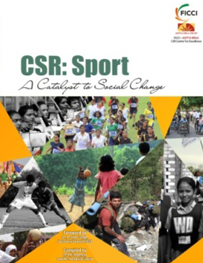 This compendium captures the initiatives in Sport through CSR in India by 11 companies in remote areas of India. This includes Barclays’ Spaces for Sports program, Coca Cola India’s initiative of promoting active healthy living and opportunity and platform to all youngsters across the country through cricket, Essar Group’s initiative of promoting sport with aim to engage rural youth in a productive manner, JSW’s aim of providing equal opportunity for People with Disability through Sport, Oil India Limited’s initiative of promoting rural sport in rural Assam, Rio Tinto’s initiative of supporting the development of children and young people in the Keonjhar district of Odisha, Vedanta’s efforts through sport to enhance the spirit of fraternity and strengthening solidarity amongst the community and as an effective method of community engagement especially amongst the rural and tribal youth groups and other initiatives of Standard Chartered Bank, TATA Steel Limited, Thriveni Earth Movers Pvt. Limited etc.The book was released on May 15, 2013 during the conference “CSR: Sport- A catalyst to social change”.